The steps of the waiting room at Antwerp's Centraal Train Station. Another skimpy showing today. I originally intended to publish a user-controlled panorama of Centraal Station's waiting room but for whatever reason, the several sets of panoramas that I captured wouldn't stitch together properly and despite hours of manual intervention, I couldn't complete it before this publish deadline. 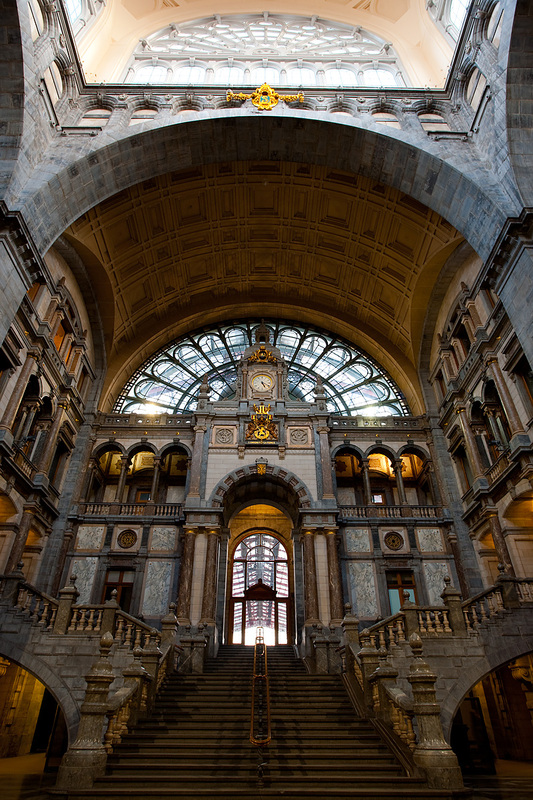 What's more heartbreaking is that to obtain the panorama images, I had to suffer the abuse of a train station official who yelled at me in Flemish for taking photos in the train station. Later a policeman explained that because I was using a tripod, I was therefore a professional photographer and had to apply for special indoor shooting privileges. Odd. Because I want sharp photos with the aid of a tripod, I'm automatically a professional photographer. By this logic, I'm also a professional chef because I use a restaurant grade knife.